Acura RSX Pros and Cons | Page 1 of 1 | Why Not This Car? What drives people to buy (or not buy) a certain car? 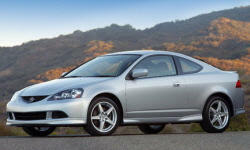 TrueDelta's members share Acura RSX pros and cons based on their real-world driving experiences. The RSX checked all the boxes for me: Reasonably quick, reliable, fuel efficient, good looking, hatchback practicality, and fun to drive. On smooth roads, the car is a dream. On poorly maintained roads, it can feel like a chore because of the stiff performance suspension. 210HP 8300rpm red line is responsive, loves to rev and scream oh so smooth. Shifter positions are clean and crisp. Looks good, everyone likes it. I have 125,000 miles and NOTHING that isnt a wear item has needed to be replaced. Bulletproof car. Very high quality materials inside. Much nicer that similar Toyotas or Subarus. Stock suspension offers excellent road feel, and the steering is tight enough for precise control but is still pleasant to drive. Turns are easily made without excessive braking, since there is little body roll. I have had the car for five years with no problems and very little maintenance. 30+ mi/gal with the above performance. Unheard of. Underpowered, even for a small car. I expect 200 HP these days and anything less feels mediocre.